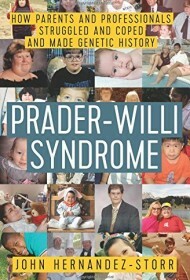 It’s hard to imagine a more devastating diagnosis than Prader-Willi Syndrome, the rare genetic disorder for which five-month-old Curtis Deterling tested positive in 1971. It explained his poor muscle tone and sucking reflex, and the fact that he was too weak to cry. It also portended a horrifying future. By age two, the once-feeble baby would develop a raging appetite to go with his sluggish metabolism, resulting in morbid obesity and, most likely, premature death. His short life would be further marred by impaired intellect, severe behavior problems, vision and speech difficulties, and obsessive-compulsive disorders among other issues. With meticulous research and flawless writing, Hernandez-Storr depicts this strange world in which no amount of food satisfies, and attempts to withhold it trigger violent outbursts. Alternately written from the perspectives of the afflicted and those struggling to save them, the result is a seamless blend of case history, detective story, and medical mystery, often heartbreaking, occasionally hopeful, always full of heart. The current obesity epidemic is bringing new interest and awareness to this once-obscure condition. As yet, there is no cure. Until one is found, Hernandez-Storr’s book is a gift not only to Prader-Willi sufferers, but to readers of exceptional prose the world over.